(Bloomberg) -- President Donald Trump’s trade battle with China is showing no signs of letting up, even after he made peace with the European Union and signs mounted that a tentative deal on a new NAFTA may be reached next month. The pact with the EU to refrain from new tariffs, announced Wednesday, has Bank of America Corp. economists suggesting a possible turning point in the global trade war. To celebrate the breakthrough, Trump tweeted a photo of European Commission President Jean-Claude Juncker greeting him with a kiss on the cheek. Meanwhile, relations between Washington and Beijing showed no signs of improvement Thursday as Trump’s top trade negotiator played down the prospect of a quick compromise and a top Chinese trade official railed against U.S. trade strategy as “extortion.” Those were the latest signs that common ground with China remains a major challenge. A negotiating framework with Beijing in May lasted just days before Trump called for deeper concessions. “We clearly have a chronic problem with China,” U.S. Trade Representative Robert Lighthizer said in Senate testimony, estimating that trade issues with Beijing will take years to resolve. He said the Trump administration believes it must push back against China because it uses “state capitalism” to take advantage of the openness of the U.S. economy, costing Americans jobs and wealth. In the early stages of talks, it appeared that Beijing might mollify the president by pledging to buy more American soybeans and energy, as the Europeans did this week. But Lighthizer’s remarks portray the trade dispute as a longer-term clash between radically different systems. If such a view prevails in coming months, it signals slimmer odds Trump can reach a deal with Chinese President Xi Jinping, who’s shown little desire for abrupt economic strategy shifts. In the most recent sign of the U.S. and China’s frayed economic ties, Qualcomm Inc., based in San Diego, scrapped its $44 billion bid for rival chipmaker NXP Semiconductors NV after Chinese regulators failed to approve the largest-ever deal in the chip industry. Interviewed earlier Thursday on CNBC, Treasury Secretary Steven Mnuchin said he was “very disappointed” in China’s decision. The hearing gave both Democrats and Republicans a chance to criticize Trump’s trade policies, highlight the pain on American farmers and businesses, and point out the lack of a timetable for resolving the disputes. China’s authoritarian political system offers its officials the ability to wait out the U.S. on trade issues, said Senator Brian Schatz, a Democrat from Hawaii. The deal with the EU suggests Trump will take an even harder line with China, rather than backing down, said Dan DiMicco, a former steel-industry executive who advised Trump during the 2016 campaign. The Trump administration this week held public hearings on its plan to target $16 billion in Chinese goods targeted with duties of 25 percent, which could be imposed after a comment period ends July 31. The administration imposed tariffs on $34 billion of products on July 6, after similar hearings in May. 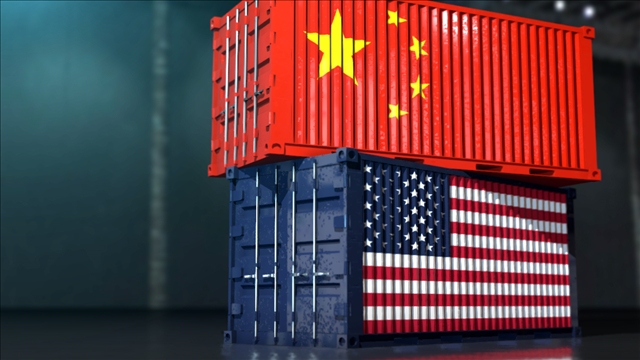 The U.S. has also identified an additional $200 billion of goods slated for a 10 percent duty after China announced retaliatory levies, and Trump has said he’s “ready to go” with tariffs on $500 billion in imports -- roughly the annual value of all U.S. imports from China. The U.S. deal with the EU is a “clear negative for China,” said Alicia Garcia Herrero, chief Asia-Pacific economist at Natixis SA in Hong Kong. Even as he criticized China, Lighthizer expressed optimism of a deal on a new North American Free Trade Agreement. The U.S. hopes to conclude an agreement-in-principle with Canada and Mexico in August, Lighthizer said. The Mexican peso rose following his comments.